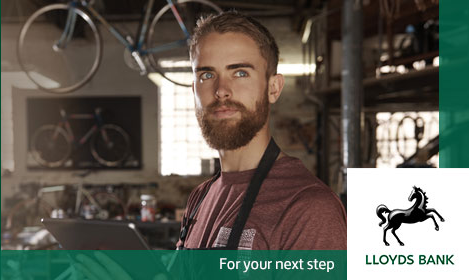 With a range of time saving tools and tips, the Lloyds Bank Business Current Account can help you focus on what matters. 18 months’ free day-to-day business banking*. Support from our UK-based business management team. Access your account over the phone, in branch or on the move with the Mobile Business Banking app. Online business guides through the Business Knowledge Box and current research on the Business Resource Centre. 18 months’ free day-to-day business banking includes: no monthly account fee, electronic payments, cheques and cash withdrawals/deposits. All we ask is that you operate your account in credit, or within your agreed overdraft limit. To qualify for this account you need to be a sole trader, partner or company director and be 18 or over. This account is available for businesses with an annual turnover of up to £1 million. When your 18 month free day-to-day business banking period ends the simple pricing plan below will apply. There is no charge for electronic payments, including withdrawing money from a Cashpoint® or payment by Direct Debit. *Free business banking includes electronic payments, cheques, cash, deposits and withdrawals. All we ask is that you operate your account in credit or within agreed limits. Free electronic payments include UK Sterling Direct Debits, Standing Orders, Debit Card Transactions, Lloyds Bank/Other Bank ATM Withdrawals, Internet/Phonebank Debits/Credits, Faster Payment Debits/Credits, Internet Bulk Payments and Automated Credits. We don’t charge you for Mobile Banking but your mobile operator may charge you for certain services such as downloading or using the app, so please check with them. Our new app requires iOS 7.0 or above, or Android 4.1 or above. Internet Banking registration required. Services may be affected by phone signal and functionality. Use of Mobile Banking is subject to our Business Internet Banking Terms and Conditions. Lloyds Bank plc Registered Office: 25 Gresham Street, London EC2V 7HN. Registered in England and Wales no. 2065. Telephone: 0207 626 1500. Authorised by the Prudential Regulation Authority and regulated by the Financial Conduct Authority and the Prudential Regulation Authority. Quick File Ltd and Lloyds have entered into a referral arrangement whereby a fee will be paid by Lloyds to Quick File Ltd on the successful opening of a Lloyds Business Account.